In the northern midwest United States, within the confines of the Big Ten Conference, lies the Football Bowl Subdivision’s (FBS) oldest rivalry, and no, it is not Ohio State vs. Michigan. The oldest rivalry in the FBS has taken place each and every year, except one, since 1890 between the University of Minnesota Golden Gophers and the University of Wisconsin Badgers. When the Badgers and Gophers first met on the gridiron, it was just another game. Wisconsin was in their second year of football and was coming off of an absolute drubbing of Whitewater Normal School, which is now called the University of Wisconsin-Whitewater and currently plays football in Division III, 106-0. That win still stands as the most lopsided victory in Wisconsin history. Minnesota began playing football in 1882, took a two-year break from 1884-1885, and was on their sixth head coach in five years of football (the Gophers had four different head coaches in 1889). Minnesota took the trip southeast to Madison, Wis., to take on the Badgers, and it did not go well for the home team. The Gophers topped the Badgers 63-0 in the most lopsided game in rivalry history, and the only game where one of the teams eclipsed the 60-point barrier. The two schools decided to make this an annual meeting, and it has stayed that way to this day. The teams did decide to not play each other in 1906, but that is the only time that has happened. The series continued the next year in Minneapolis, and the Gophers came out on top once again, albeit much closer this time around, 26-12. The Badgers would earn their first victory in the series in 1892, as they beat Minnesota 40-32 in Madison. The teams would then trade wins for the next three seasons, with Minnesota winning two of them. In 1896, both teams entered into the Western Conference, the first precursor to what is the Big Ten Conference today. They were joined by the University of Chicago, University of Illinois, Northwestern University, Purdue University and the University of Michigan. Entering into the conference ensured that the teams would meet on an annual basis. The first conference game between the two schools ended in a 6-0 Wisconsin win, which would be the first of four straight for the Badgers. In 1899, the Western Conference changed its name to the Big Nine Conference, as the University of Iowa and the University of Indiana joined. The Paul Bunyan Axe is the trophy given out to the winner of the Wisconsin-Minnesota football game. The original axe was retired after the 2003 game. The handle of the axe is six feet long and players of the winning team act like they are chopping down the goal posts after they secure the trophy. Photo courtesy of Josh May on Flickr. Wisconsin’s streak would end in 1900, as the Gophers won a very close game 6-5. Wisconsin would add another win the following season, but Minnesota would then go on to win the next three, from 1902-1904. Wisconsin would win 16-12 in 1905 before the series would take a one-year hiatus in 1906, the only time the two schools have not met on the football field since 1890. When the two schools played again in 1907, the conference had shrunk down to eight teams (Michigan had been voted out for failing to adhere to league policy), and the first tie between the two schools occurred. Wisconsin and Minnesota would end up tying 17-17 that year. Luckily, that would not become a trend as Wisconsin won in 1908, and Minnesota won back-to-back game in 1909 and 1910. The tie would rear its head again, however. In 1911, the two schools tied 6-6. That would be the last tie for 11 years, during which time Wisconsin would win five games and Minnesota, six. The conference would also gain two more members, and go by the name Big Ten Conference for the first time as Ohio State University joined in 1912, and Michigan re-joined in 1917. The next three years would see three ties. In 1923, the teams tied 0-0, followed by a 7-7 tie in 1924 and a 12-12 tie in 1925. Minnesota got tired of the ties after this, and decided to go on a bit of a run. Over the next 24 years, from 1926-1949, Minnesota would win 20 games, including a span of nine straight wins from 1933-1941. This time period would not only see complete dominance by Minnesota in the rivalry, they would also win five national championships (1934-1936, 1940-1941). It was also during this time that a trophy was first given to the winner of the Minnesota vs. Wisconsin game. Beginning in 1930, and lasting until 1943 when Minnesota head coach George Hauser refused to accept the trophy and it was taken back to Wisconsin and subsequently misplaced, the winner of the game was given the “Slab of Bacon.” The Slab of Bacon is a chunk of black walnut that has a football in the middle with an emblem on top that is a W or a M, depending on which side it is hung from. It also has the word “Bacon” carved on either side, with the significance that the winner of the game will have brought home the bacon. The Slab of Bacon, the former trophy given to the victor of the Wisconsin-Minnesota football game, after being lost for over 50 years, was found in a storage closet at Camp Randall Stadium. It now displayed at the Camp Randall Stadium Football Offices. Photo courtesy of user Gopherbone on Wikimedia Commons. Minnesota won the Slab of Bacon 11 times during its 14-year tenure. After the disappearance of the trophy, neither team was awarded anything for winning until 1948, when the Paul Bunyan Axe was created and given to the victor. The trophy-less years (1944-1947) saw three Minnesota victories and a single victory for the Badgers. The Big Ten would also go back to being the Big Nine as the University of Chicago left the conference. 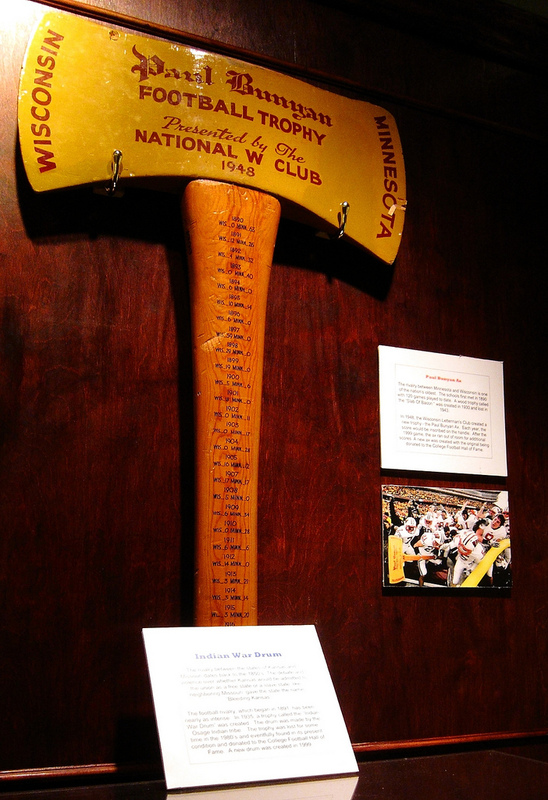 The Gophers would then go on to win the Axe, which was created by the National W Club (the Wisconsin letter winners Association) for the first two years of its existence. 1949 was the Gophers’ final win for six years, as they defeated Wisconsin 14-6. The Big Nine also re-became the Big Ten as Michigan State University joined. The conference would retain the same ten members until 1990. The 1950’s would see Wisconsin begin to show some dominance as the Badgers won six of the ten games in the decade. Minnesota would only win once during this time, and there were three ties (’52, ’53, ’56). The 1956 game would be the last tie the series has seen. The series went 6-4 in favor of the Golden Gophers in the 1960s, and 5-5 in the 1970s. The last two years of the ’70s saw the Badgers begin a six-game winning streak that would last until 1983. Minnesota responded with a four-game winning streak of their own, and the series would then see Wisconsin win 9 of 13 between 1988 and 2000, a time period that also saw the Big Ten add their 11th team, Penn State. The 21st century has not been nice to the Gophers, as they have only won twice in the last 12 years (2001, ’03). Currently the Badgers are on a nine-game winning streak that began in 2004 and has equaled Minnesota’s longest winning streak in the series (1933-1941). The Big Ten has also added a 12th team, Nebraska, and has plans to expand to 14 teams next season, when Rutgers and Maryland join the conference. Not only is the Minnesota vs. Wisconsin game the oldest rivalry in the FBS, it is a rivalry that has been vital in the history of the Big Ten Conference. Both teams are charter members and their rivalry has kept the conference exciting for years. Sadly, due to the recent decline in the Minnesota football program, this rivalry has gone to the back of many fan’s minds. But, with Minnesota on the rise and Wisconsin having been to three straight Rose Bowls, hopefully this rivalry can regain some of its lost notoriety and won’t be forgotten.